The Offset Pressman: What Is Heatset Printing Ink Made Of? What Is Heatset Printing Ink Made Of? Each of these categories have similarities, but basically differ in the ingredient referred to as the vehicle. This component has the most potential for manipulating the properties of the printing ink. However, let's zero in on heatset printing ink broken down into six main components. This part of heatset printing ink helps differ it from all other types and makes heatset printing what it really is. In its natural state, resins thickens the ink somewhat. However when it enters the dryer, this is where the magic happens. These thermoplastic resins will melt by the extreme heat and by means of a chemical process, bond to the pigment within the ink body. When the resin in the heatset printing ink leaves the dryer, it it then cooled and essentially hardened by the chill rollers. Though it behaves like resin in the cooling process, it's purpose differs. Waxes like paraffin in the ink will reduce problems of setoff in the finishing process by providing more slip to the surface. These give the ink its color. Heatset inks as well as most offset printing inks tend to use transparent pigments for the sake of utilizing the four color process. 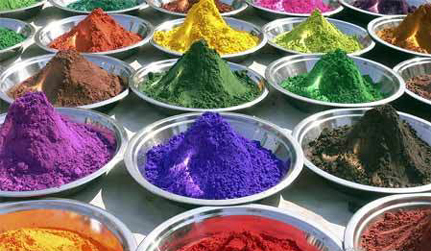 Colors are made form what is known as flush pigments. Each pigment must show the color below that it was laid on top of. In the manufacturing step, pigments are made as a powder and then dispersed into the vehicle. Black pigment powder simply comes from carbon black. This is where heatset printing ink departs from other types. While all inks require some sort of vehicle to transport the pigment, the vehicle composition will vary depending on the process. Here is where properties of the ink are determined such as tack, viscosity, water pickup and ink/water balance. Additionally, given the drying process for heatset printing ink, this vehicle is formulated in such a way as to bind the pigment to the paper when it passes through the oven. Solvents are used that meet the desired flash point for the dryer and completely evaporate. This is what makes high speeds with heatset printing possible. While coldset printing requires help from additives to react with oxygen, heatset printing does not. However some heatset ink manufacturers will drying resins to help ensure that the ink is completely dry at the end of the process. Click here for more information on troubleshooting offset printing ink.